The market and individual stocks in general continue to get pounded so my screens will continue to provide us with short candidates or stocks trending lower. Today’s screen gives us five stocks that show the 10-week moving already below the 30-week moving average and two stocks headed in that direction. 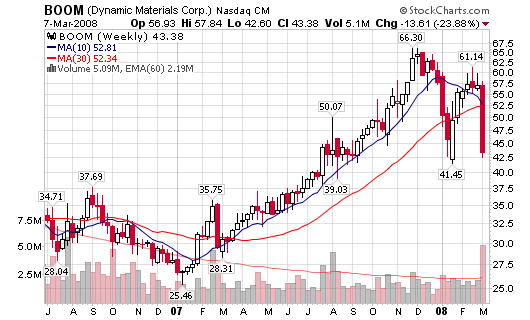 CMTL – 42.59, the stock dropped $4.66 on Friday on volume 147% larger than the average. 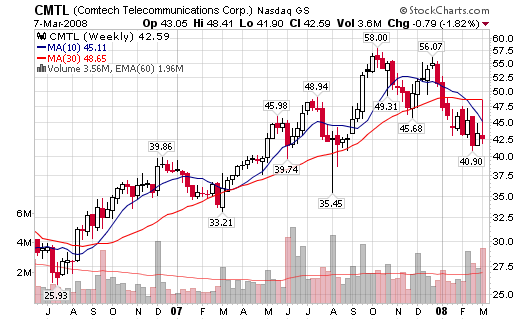 We also witnessed a large reversal at the 30-week moving average as the 10-week moving average continues to move lower. 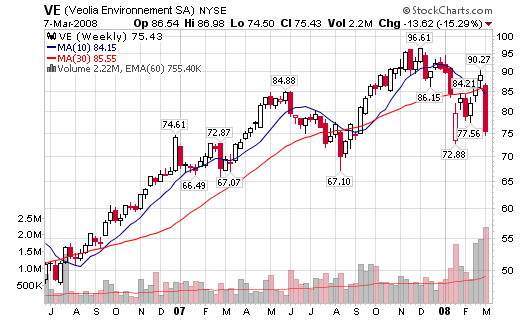 VE – 75.43, the stock was down 15.29% last week with volume 350% larger than the 50-d m.a. on Friday (it was the largest weekly volume in years). MR – 30.99, one of the top performing stocks on this blog in 2007; but it is now facing some trouble as the 10-week m.a. 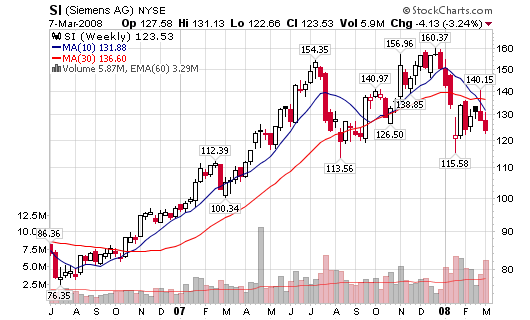 is below the 30-week moving average. Volume is starting to increase during distribution weeks. 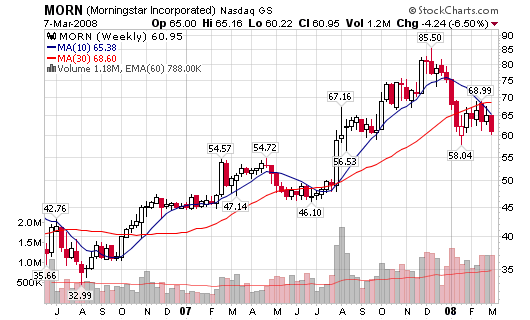 MORN – 60.95, the stock failed to complete the $60-$100 run as the 10-week m.a. 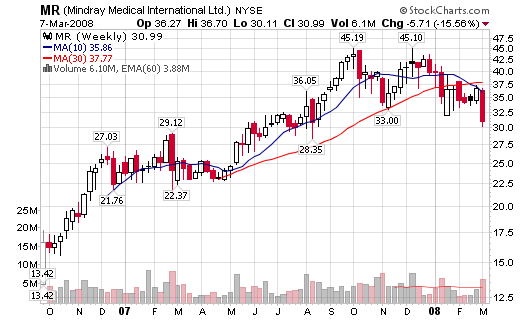 is now below the 30-week moving average. Volume is increasing with multiple distribution weeks over the past four months. SI – 123.53, Siemens is falling on above average volume with a recent reversal at the moving averages. Both the 10-week and 30-week moving averages are trending downward. BOOM – 43.38, the former high-flyer was down $10.22 on Friday (volume was 592% larger than average) or 23.88% for the week on the largest volume in eighteen months. 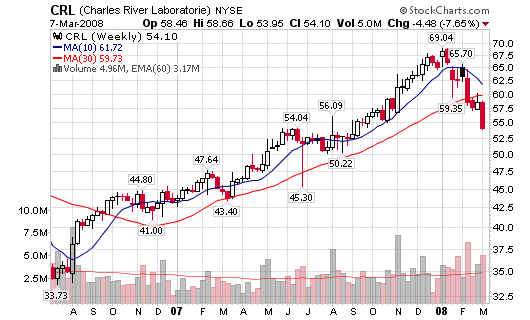 CRL – 54.10, the stock is falling hard over the past two months on above average volume. The 10-week m.a. is still above the 30-week m.a. but the are starting to turn downward.